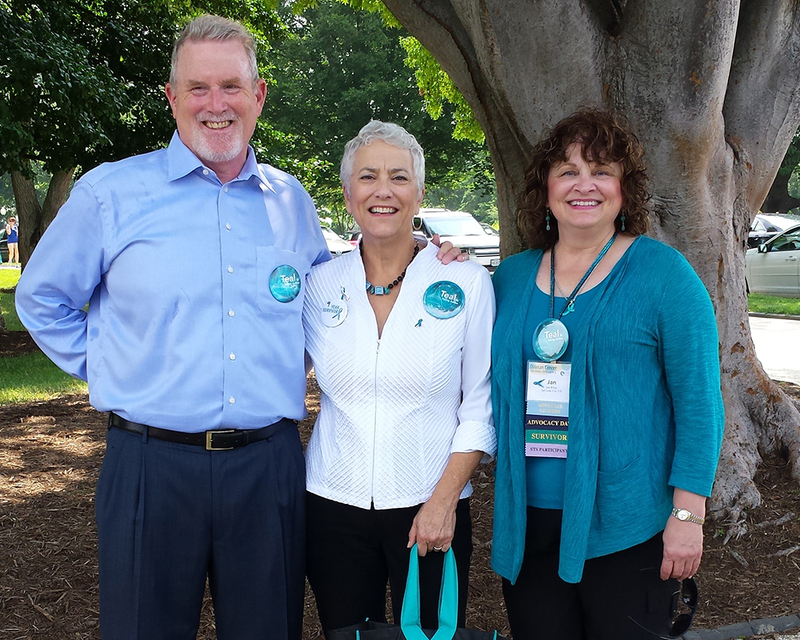 Jan Byrne (right) and colleagues at the Ovarian Cancer National Conference in Washington, DC. As an obstetrician diagnosed with ovarian cancer, I’ve heard this many times: “You are so lucky—you know all about cancer and could be diagnosed really early.” Nothing could be further from the truth. Looking back, I actually had a lot of symptoms, but most were very vague and non-specific. Ovarian cancer can be hard to diagnose for this very reason. Finally I saw one of my colleagues, who felt an abdominal mass. An ultrasound showed the mass to be in one of my ovaries. The next day, in the office of one of our gynecologic oncologists, we planned surgery for the next week. On May 9, 2011, I was diagnosed with clear cell ovarian cancer. While it was limited to one ovary and early stage, it was high grade, so chemotherapy was on the horizon. It may sound strange, but initially, the diagnosis of cancer was almost vindicating—I had seriously begun to think I was crazy, with a bunch of weird symptoms that made no sense. Then the reality of the diagnosis set in. I had never known an ovarian cancer patient who survived, and I felt like I was being handed a death sentence. In fact, the senior pastor of my church was being treated for ovarian cancer at the time I was diagnosed. She was my confidant, and she died during my treatment. After six courses of chemotherapy and another major surgery, I was trying to cope with the “new normal” of being a cancer survivor. Cancer and its treatments change you forever in ways you can’t anticipate. I was determined to make a difference for others facing the same diagnosis, so I became heavily involved in advocacy. Each year, approximately 22,000 women in the United States are diagnosed with ovarian cancer. More than 14,000 will die, most within the first year of diagnosis. If patients are diagnosed at early stages, there is a 93% five-year survival rate. Unfortunately, only about 15% of people are diagnosed early. As part of the Survivors Teaching Students program of the Ovarian Cancer Research Fund Alliance (OCRFA), we teach medical students, OB-Gyn residents, physician assistant students, and nursing students about ovarian cancer. As an Advocate Leader with OCRFA, I speak with elected officials about research funding, health care legislation, and other issues affecting the cancer community. I am a patient advocate with the Women’s Disease Oriented Team at Huntsman Cancer Institute (HCI). 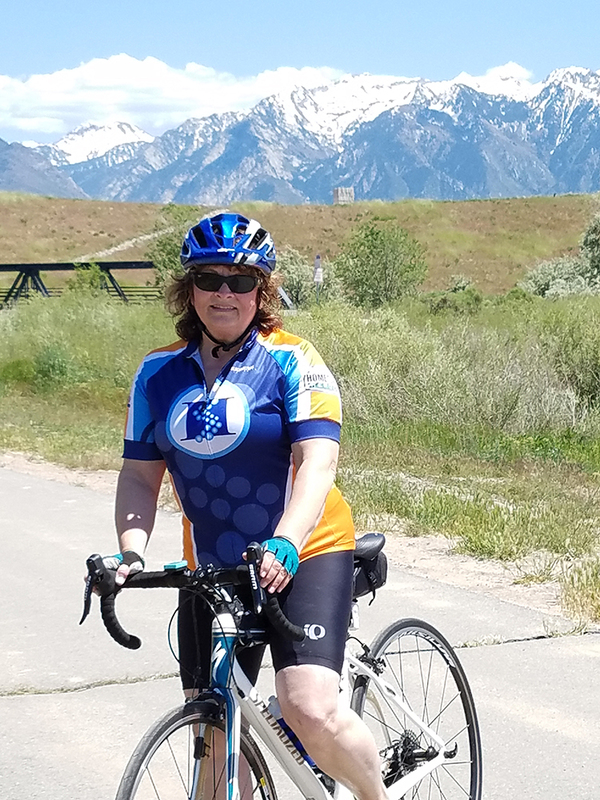 Finally, I founded the Utah Ovarian Cancer Alliance (UOCA) to increase education and awareness about ovarian cancer and provide support to newly diagnosed ovarian cancer patients at HCI. For many cancer survivors, there comes a time when you redefine your purpose in life. Often it’s when you decide there is more to survival than just being alive—you have to go on living and decide what you can do for others. As an ovarian cancer advocate, I speak out for myself. I speak out for others, especially those who can’t speak for themselves. And for those who are no longer with us, I speak out for the families they’ve left behind. I will be forever grateful for the wonderful care I received at HCI and the support I feel as I continue to be followed here. Learn more about ovarian cancer and its symptoms. Learn more about Jan Byrne, MD.